Raisins are dried up grapes which are a healthy fruit used in many fine restaurant dishes and meals. We have been selling Raisins to restaurants for 40 years for their salads and desserts. 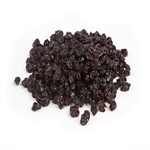 Buy your wholesale Raisins from the leader in restaurant supply and keep your patrons healthy and vibrant. The most comprehensive study ever done on diet and nutrition has proven that a diet of fruits and vegetables is optimal for your body and preventing cancer. So feed more raisins and grapes to your food patrons. Dole Raisin Seedless Dates - 1.5 Oz. Kraft Planters Nut Seeds Cranberry Trail Mix - 6 Oz. Raisins Fancy Golden Bleach - 30 Lb. Raisins Golden Bag in Seedless Box - 15 Oz. Raisins Midget Seedless - 30 Lb. Raisins Seedless Select - 15 Oz. Raisins Seedless Selecto - 30 Lb. Raisins Select Seedless - 1.5 Oz. Raisins Select Seedless - 2 Lb. Filling Whole Raisins - 22 Lb. Cherry Craisins - 1.16 Oz. Craisins Original - 1.16 Oz. Amazin Raisin Orange Infused Raisins - 1.3 oz. Amazin Raisin Peach Infused Raisins - 1.3 oz. Amazin Raisin Strawberry Infused Raisins - 1.3 oz. Amazin Raisin Sour Watermelon Infused Raisins - 1.3 oz. Amazin Raisin Sour Lemon Infused Raisins - 1.3 oz. Restaurant Raisins are a great ingredient for many dinners and desserts and they are healthy with tons of antioxidants. Made from drying grapes, they are full of vitamins and minerals.